Why did the New York Times scrub out news that it broke about the White House-crashing couple’s ties to an organization that supports Islamic terrorism? 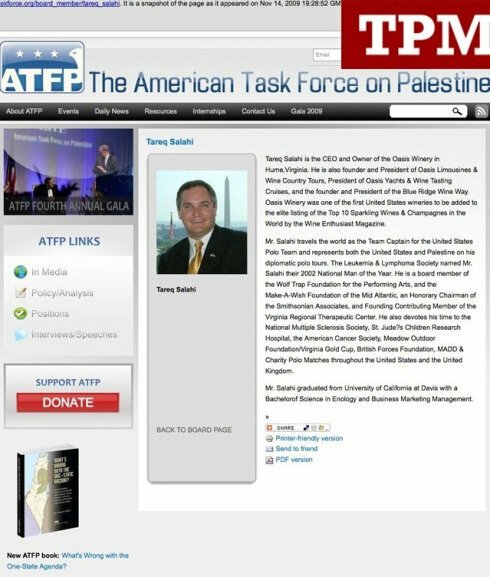 Yes, Tareq Salahi, the male half of the couple who crashed the White House State Dinner for Indian Prime Minister Manmohan Singh, is a Palestinian and likely Muslim. And not only that he’s an activist Palestinian who is likely Muslim, and who is on the board of the Muslim-dominated American Task Force on Palestine (see the google cached page, which has since been scrubbed), a group which–as I’ve previously noted on this site–is anti-Semitic and believes that all of Israel is Palestine and which openly supports HAMAS, Hezbollah, Islamic Jihad, and all of their mass-murdering terrorist attacks. But, strangely, the New York Times–which first reported Salahi’s membership on the ATFP board– has scrubbed that from the article that first appeared Thursday. Yup, now there is no reference at all to the American Task Force on Palestine in the article which originally reported that. Why? I’m sure it has noooothing whatsoever with protecting Palestinians (who are likely Muslims) from bad press, right? Maybe NYT reporters, Helene Cooper and Brian Stelter, can tell us why their report was doctored. And it looks like the NYTimes gives good lessons in whitewashing to the ATFP, which also scrubbed all references to Salahi from its site. We wouldn’t want any Americans thinking that Palestinians who support terrorism against innocent people would actually crash a White House party, now would we? Sad that I have to reference the far-left, but only Talking Points Memo bothered to capture the scrubbed ATFP page, below. Too bad they didn’t do a screen save of the New York Times article, too. There’s a whole lotta Formula 409 and Comet being put to use over this strange and calculating couple. And the wife, Michaele Salahi, is a congenital, psychotic liar, apparently. All of the things the mainstream media reported about her are false. No, she was never a Victoria’s Secret model, as she claims. No, she was never a Washington Redskins cheerleader, as she claims. It goes to show you that the MSM is inclined to believe anything a Palestinian (and a likely Muslim) says about himself on his Facebook page . . . and anything the dhimmi-witted Barbie doll future womb donor who is sleeping with him says about herself on that FB page. And don’t forget, this is the guy who sued his own parents to take ownership of their winery. One extensive news report of the epic legal battle compared the family’s story to the soap opera “Falcon Crest,” and reported that Salahi blamed his mother for a failed winery purchase bid by NBA star Shaquille O’Neal. Well, I guess we shouldn’t be surprised that a guy who supports the homicide bombings of innocent people, would literally run over his parents to get what he wants. The White House-crashing by this couple is such a comedy of errors, such a huge security breach, that it would make a great movie sequel to “The Wedding Crashers. Since he’s the blond, I pick Owen Wilson to play bim Michaele Salahi. And Vince Vaughn can bone up on the terrorist-accented Palestinian dialect of Arabic to play Mr. Salahi. I have theory. may be they were really invited. What if Obama and the beatiful blonde wife has some love affair going on??? It looks like they are connected at the picture. 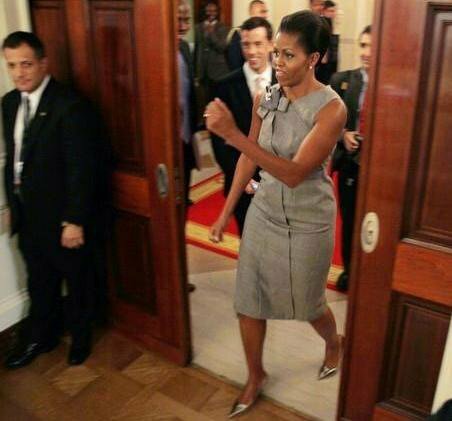 May be michelle Obama made huge case so this way she would prevent Michelle Saleihi to be around anymore. HIMMM??? Guess who else works with suspect groups…Grover Norquist. The Islamic terror war ALWAYS included taking young men and women, cleaning them up, educating them with terror financier’s moneys (e.g., Yassin Al Qadi) to credibly integrate them and put them in key positions within all US government agencies, and other places. The target at that WH function, if any, would not have been the US President, of course, but LIKELY the Prime Minister of India, because an Islamic operative assassinating the Indian Prime Minister in the US White House would destablize India, Pakistan and the whole 9 yards there. That would have played into the hands of the every single Islamic extremist in power who was put there by Islamic terror money (and, in my book, the Chicago Political Machine does qualify for that). As for the US Secret Service failing? I hardly doubt it happens “just like that”, especially with THREE of the staff involved…have we learned NOTHING from JFK’s assassination, where elements within the Secret Service were shanghaied – and from within? No Indian politician – much less the Prime Minister – should ever EVER go to the WH again, it was a bloody insult to the largest democracy left on the planet. And to every American of Indian origin. As for whoever set up that event, if Obama believes “the buck stops here”, then it is HIS responsibility, and he should be ashamed to let things have gone that far. My goodness, have the decency to politically assassinate from a distance. No wonder they set up the event on a lawn tent outside (were there outhouses too?) Keeps the blood spatters from spoiling the inside of the WH. No one considers this anything less than the final islamic terror showdown, and with a shadow President in charge, you better start wondering if the ultimate unspeakable regarding the fate of the US will happen from that seriously stained White House. As a PS, I cannot believe it has been 8 years since 9/11 and did all those terror victims die in vain? So few – even those who seem to understand the Islamic terrorist threat – have gotten this about Islamic terrorism/&/their hundreds year old killing cult. The tenets of Takiyya state you can do whatever is necessary – overtly convert to another religion, dress anyhow you like, drink alcohol, do drugs, sell drugs, visit whorehouses, kill Muslims even, kill your mother even i.e., do anything you want in order to achieve your Islamic goal. Read your history, and you will see the actions of all Islamic terrorists of this era – begin to fall into place. Including those who portray themselves credibly as Republicans, Democrats, Catholics, selfless financiers, and yes, even drunk, thieving whoring airline pilots, like Atta did – there are those of practicing Taqiyya who are, or can credibly pass themselves off as American, Brits, Germans, Israeli’s whatever it takes to get their “Allah Akbar” Islamic terrorist attack done. Again, I cannot believe after 9/11 I am seeing questions about how those two twits pulled all their capers off, that they are Catholics etc. without a THOUGHT to the ultimate deceptive practice of Taqiyya. Don’t for a minute think they are truly embarassed. Does this knowledge make it easier or harder to understand how the Oval Office got to be the kind of Oval Office it is today? Didn’t anyone notice what she was wearing for the special event at the White House. Clue #1 or just fashionable? Didn’t anyone bother to check out the background of these 2 people and their community organizations that they have been involved with in their pasts and presently if crashing a presidential dinner party is supposedly a serious violation of security, not only for the White House, but for the American people? Is it really that easy to walk into a White House dinner party for the U.S. President and be greeted with a smile and a handshake and sit at his table without anyone noticing – if that’s the case then what’s the point and why are average Americans being searched, x-rayed, eye-scanned, fingerprinted, ID’d, and so forth just to get into a public building if anyone can walk through unidentified – just like the “detainees” who went through our schools – walked through our airports – boarded our planes – and we know the rest of the story…. Whitehouse has been highjacked by Islam and that is just a start by Islam occupation. I have to state, you chose your terms properly. The ideas you wrote on your encounters are well positioned. This is an extraordinary blog!